374 football games for you to enjoy! A&BC footballer card game - NEW! Blow Football (Kevin Keegan) - NEW! 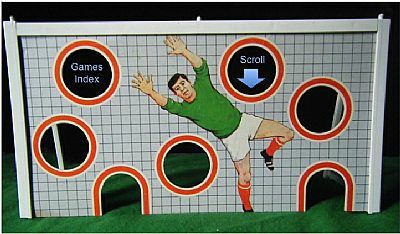 Finger Football (Junior) - NEW! Foot Ball (Tomy) - NEW! Football Chez Soi - NEW! Football Tournament (book game) - NEW! Games in the rain (KumBak 2) NEW! Goalgetter Super Kicker - NEW! Janda Home Football - NEW! Kevin Keegan Play'n'Score - NEW! Kika Goal (fold out box pitch)! Master Manager (Manchester United) NEW! Matchday (2 versions) - NEW! Mini-Football (Kelloggs 1967) - NEW! Penalty Kick (Chad Valley) - NEW! Peru 1970 world cup - NEW! Play at Melchester Stadium - NEW! Pola 600 Star Cup - NEW! Professional Football Card Game - NEW!! Seamor Club Football game - NEW! Simple Soccer 1969 - NEW! Skillball (George Best) - NEW! Soccer Supremo (Manchester United) - NEW! Socrates (Newfooty) box set - NEW! Sony Rental World Cup 82 set - NEW! Spin a Win Football - NEW! Spin Soccer (Shredded Wheat) - NEW! Spot Kicker (Shredded Wheat) - NEW! Swegame Real Soccer - NEW! TAF Pemier League (United v City) - NEW! Tiddley Football Victory - NEW! Top Team 1987 - NEW! Wooden Soccer Center - NEW! Write the word 'football' - NEW!